maps - online and where to get printed ones including the great Hennepin County Bike map. City of Minneapolis Pedestriain Program Similar resources for walking. Nice Ride Minnesota public bike sharing system will start in Minneapolis in May of 2010.
environmental/energy transportaion impact. Of course routes to work destinations are very significant. Luce Line Bikepath from Douglas Drive in Golden Valley to Wirth Parkway is now open. A key link west from Mpls. Pedal Minnesota Great information, see "resources"
Blue bike lanes in Denmark which are used (only) at some intersections. Picture from Fred's 1999 trip. as between it and sidewalk. 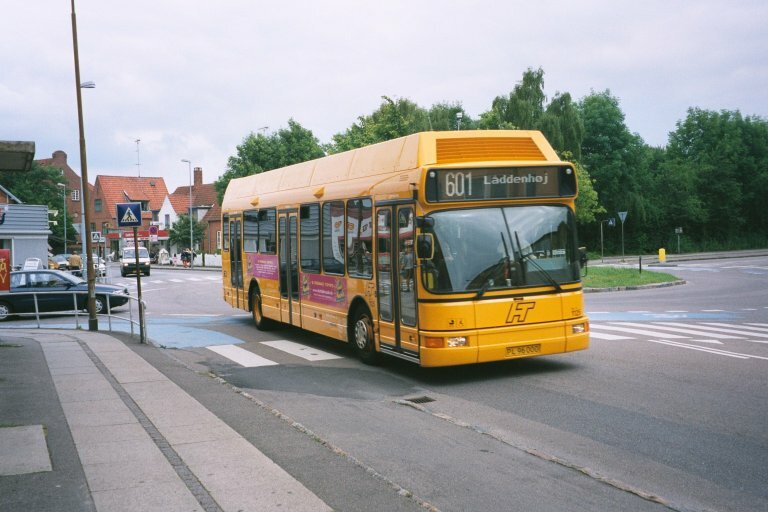 BTW note that bus has 3 doors to speed stops. 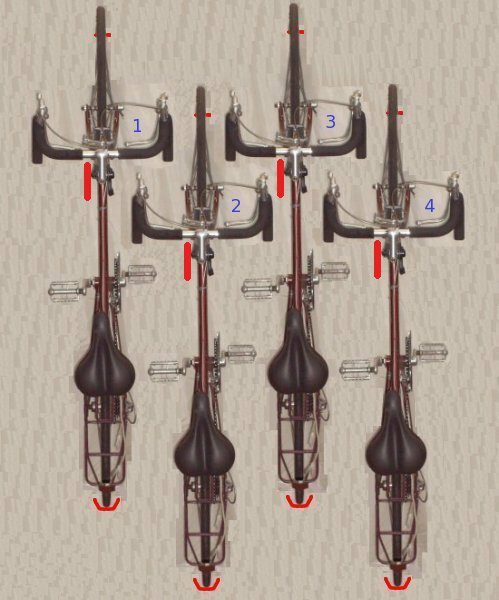 compared to the wide range of upright bikes - they are made in smaller numbers and tend to have above average components. bought a used recumbent and then another. As far as I'm concerned it is the only way to go. 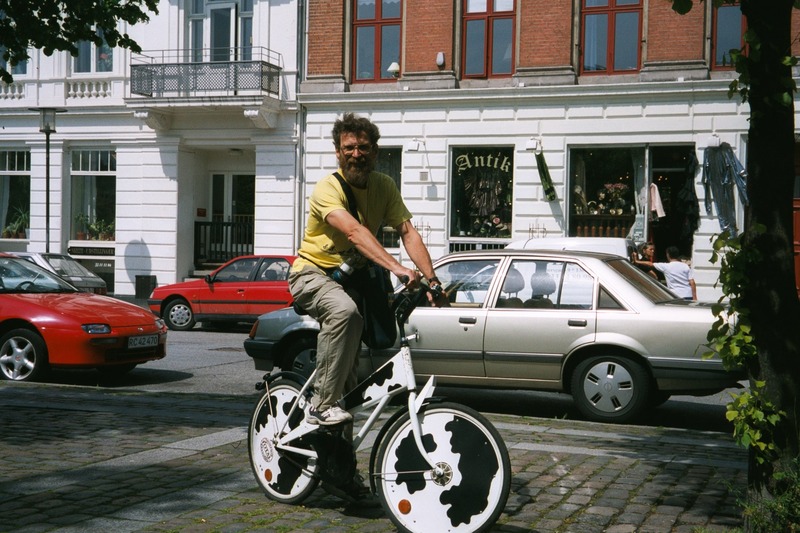 Fred's bike design and recumbent bikes it evolved from. I've never attempted to build this. Full Cycle is a bike shop based on a program to teach at-risk youth to repair bikes at 3515 Chicago Av S 612-824-7581. Calhoun Cycle Uptown area. 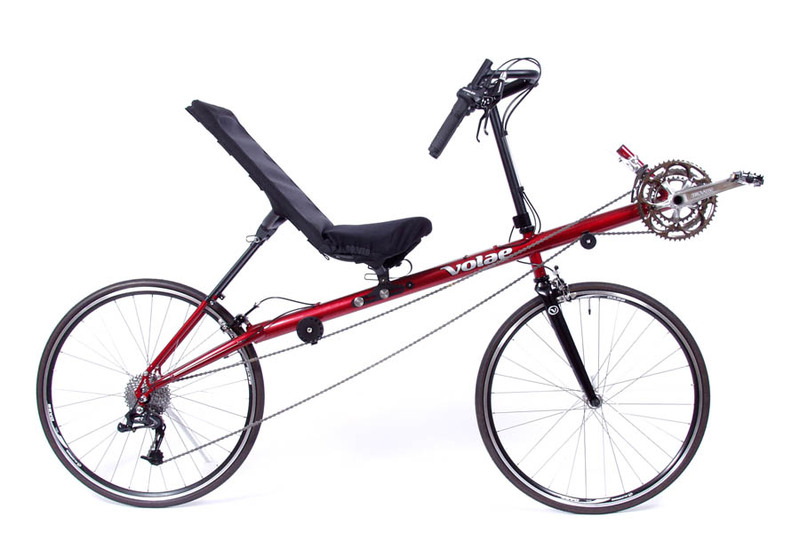 One of the nations largest recumbent and folding bicycle dealers. Sunrise Cyclery at 2901 Blaisdell Ave So (new location) has an extensive inventory of used bikes. OUT OF Business:  Edina Bike Shop NW of France Av and Hwy 62  Lower cost recumbents. 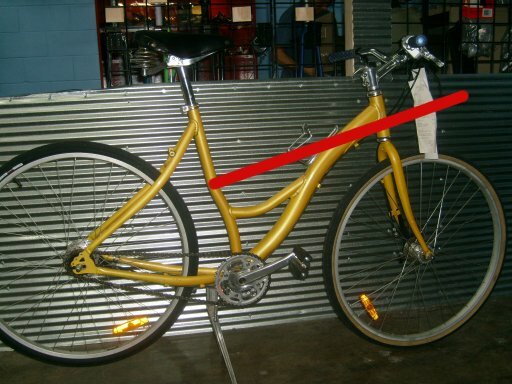 Craigslist Twin Cities bikes for sale is a good website to look for used bikes. 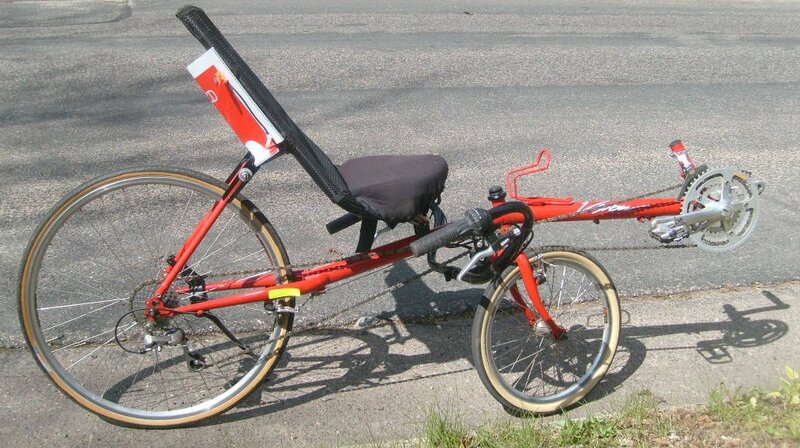 Maybe 1% are recumbent bikes. weeks listings. 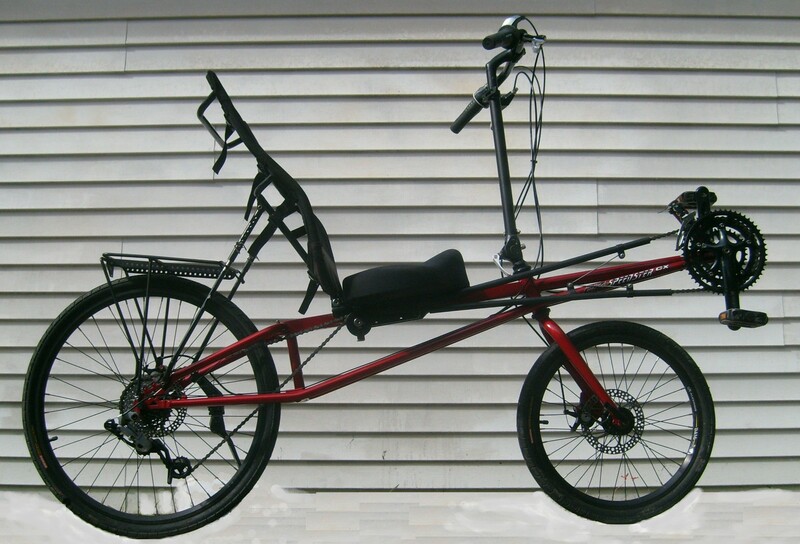 I got my last two recumbent bikes via this site. USE usual PRECAUTIONS when arranging deals. It should be possible to configure Google Alerts to notify one by email when a 'bent' shows up for sale. 6-5-2012 __ Fred's bike mishap  . (mistake 1) to inform her. So I was rushing too much (mistake 2). The bike and I went into brush and little stumps (and one 6" stump). just below the elbow. Later I learned it was called an "avulsion"
find any blood or evidence at the scene. the avulsion was the worst. I remember my helmet taking a few bumps. Fortunately my face was spared unlike my other bike crash 16 years ago. wound and my arm as a tourniquet. Becca came and took me to Urgent Care at her clinic also not far away. and that I was cared for so well so promptly. Despite the accident, the Vision remains my favorite bike. up to the bridge over the Cedar Lake Trail has been eliminated by keeping the trail up by the parkway. goose neck and easily twisted back. My recovery is coming along. In the week after my mishap I biked several times. 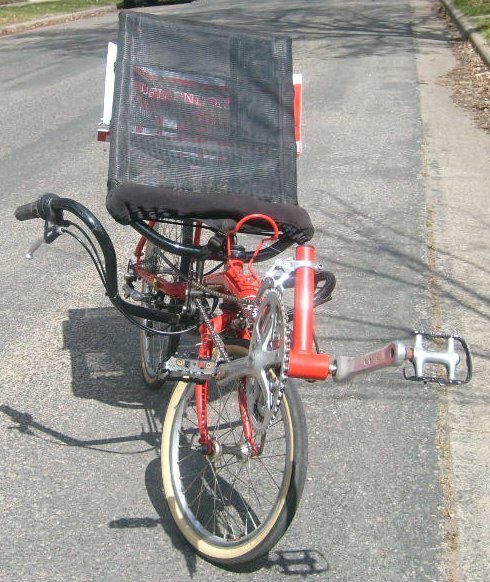 4-10-2012 __ Get another recumbent bike  . 6-10-2010 __ Nice Ride MN Public Bike system grand opening ( expensiveniceride ) . Greenway / Lake street and over to the University. needs but not others. I hope it serves enough people to be sustainable. There is no provison for helmets - logistics to do so would be too complicated. the free 30 min per trip. less than 30 minutes. Considerably higher than 40 cents or $1.50 per day with lomger subscription. grocery stores in the US now. There were seldom bikes available after early morning until evening. Clearly there was very high utilization. (outside the service area maybe around the lakes), would be $21.50 which seems to me excessive. But the system was not designed for this type of use. computer / network based a more flexible pricing system should not bee too difficult. The Niceridemn.org web site has a Station map  (use link on the right down one screen on home page). there were experimentation with prices. 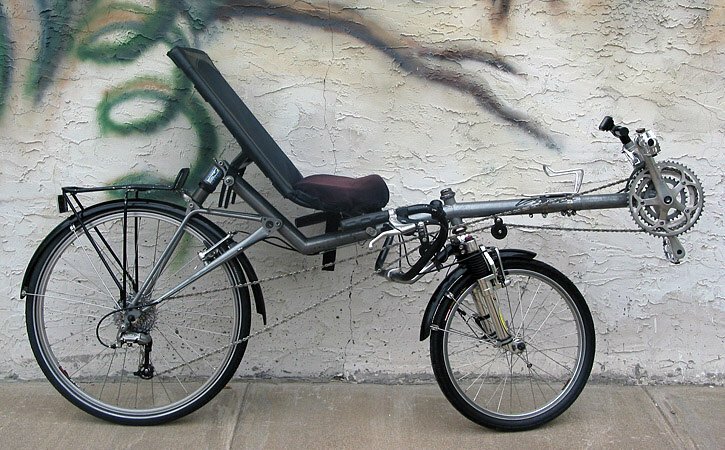 10-05-2009 __ Used Sun EZ-Speedster CX Recumbent Bike . 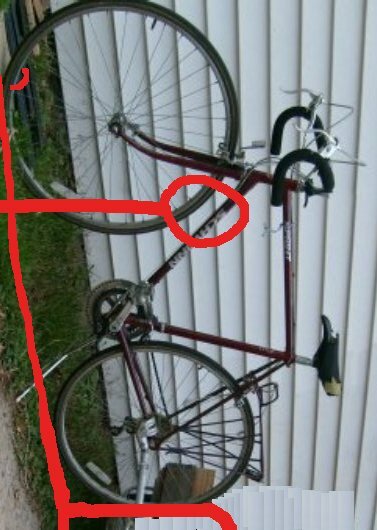 which I learned of from the Craigslist TC bikes for sale area. on one side. Red knob does not seem to alter centering (it does on back). than lower tubes. Length adjustment is minimally adequate and awkward. tube from front of rack down to frame by "down tube". Done. including a long ride on bike trails out to Lake Minnetonka. I'm quite pleased with it. installaltion of computers in a science classroom (see GCOS ). much if any air since the west bank ). I got home in  about an hour. enough to get home. All Minneapolis city buses now have a fold down rack for two bikes. If I have a suspicious tire, I'll take a pump and maybe a patch kit. There are enough resources in the city that I don't carry them routinely. o lower red is a channel where the rear tire sits. o Not shown is a ramp for the raised bikes to roll up into position. apart when hanging or removing a bike so bikes can be stored about 8" apart. clamps on the down tube. 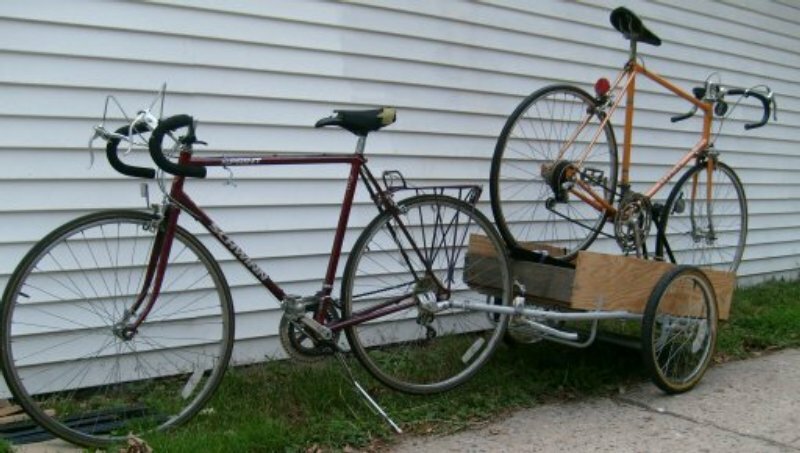 I usually use the trailer to haul water and supplies to the garden. bike for sale in Aug '07 for $695 (It was sold before I saw it) Note that it has Full Suspension.